I make collages as social media advertisements for the podcast. One of the books I cut out of is “Mormon Arts: Volume One, Brigham Young University Press, 1972”. It is a pretty cool little book. It actually came with a record in the back that has BYU Orchestra and Choir recordings on it. 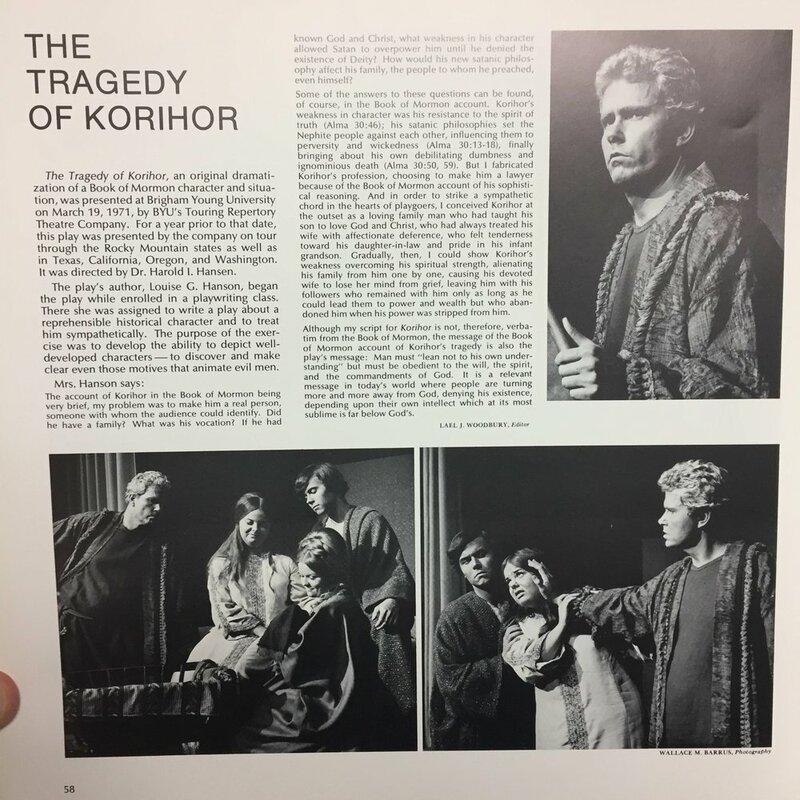 In the book there is a section titled “Mormon Drama”, and a little write-up on a play called "The Tragedy of Korihor." The play was written by Louise G. Hanson -- a student at Brigham Young University. The play was performed in 1971 by BYU's Touring Repertory Theatre Company and was directed by Dr. Harold I. Hansen. Dr. Hansen directed the popular Hill Cumorah Pageant that is put on by the Church of Jesus Christ of Latter-day Saints every year. The Hill Cumorah Pageant is an outdoor pageant that tells the story of the Book of Mormon, and of Joseph Smith finding golden plates on which the Book of Mormon was written.